It was smiles all around the Fine Arts department following three full nights and three full houses. On May 22nd, 23rd and 29th the SMS community was treated to musical theatre, band and choir performances, and an art show. Student volunteers scrambled to find extra chairs and the popcorn machine worked overtime as the gathering awaited the first down beat. It’s a stART, this year’s senior school art show, featured two- and three-dimensional work done by students in grades 7 to 12. The introduction of our visual arts 3-D courses resulted in some surprising art on display, from a giant HB pencil to strange creatures, as well as BC First Nation’s inspired fashions. In addition to decorating our hallways with exciting artwork, our two graduating Art 12 students have gained admittance into some of the top art schools in North America. Francesca Vukovic has declined a handsome scholarship to Chicago Institute of the Arts choosing to remain closer to home. Both Francesca and fellow grad Nina Chen will continue their creative studies at Emily Carr University of Art + Design in Vancouver in September. 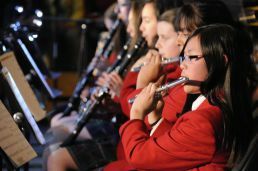 For the musical portion of the evening, sweet sounds rang through the south gym as the music department put on their year-end concert. Band 7 and Band 8 demonstrated their mastery of the fundamentals with their performance of the beginning band classics, Regal March, Minka, Let’s Go Band and Hard Rock Blues. Senior Band presented a wide repertoire, which included playing the overture from Annie Jr., a march, a Chinese folk song in a pentatonic scale, and a tribute to Louis Armstrong. The Jazz combo laid-in with an spunky performance of the Sonny Rollins favourite, St. Thomas, which featured the stylings of Beatriz Wong, Sheryl Zhou, Joyce Li, Vivian Chow, Nagisa Koga, Elly Jang and Ashley Zhou. A special thank you is due to Aelita Yang who filled in for Joyce the first night. Continuing on May 29th, the musical repertoire switched exclusively to vocals with performances by the school’s junior and senior school choirs. The audience was treated to sublime harmonies and beautifully balanced soli performances. Images from past choirs, courtesy of the school’s archives, were shown as the students sang. “Little girls, little girls, everywhere I turn I can see them,” lamented Emily van Oosten in her portrayal of Ms. Hannigan in this year’s musical Annie Jr. Such talent was presented at the auditions that two Annies were cast, Sarah Ellman and Victoria Timmis. Both girls charmed the audience, Warbucks, and his assistance Grace, convincingly played by Kamilla Hoggan and Megan Adams. Laura Sawchuk and Savii Cannatella delighted the house with the antics of Lilly and Rooster, while Marites Frazer and Erin McBride proved that there are no small parts in theatre. Also effective in their supporting roles were Madeline Lee, Sheryl Zhou, Grace Radford, Emma Wong, Andrea Loyoza, Natalie McKenzie, Amanda McMillan, Coco Xu, Blaire He, Rachel Hu, and Lauren Roberts. A big round of applause also to junior school actors Abigail Bowering, Alix Corwin, Victoria Lee, Marissa Murray, Katrina Ngan, Brecken Sales, Autumn Burtch, Zoe Dallas, Mandi McLeod, Paige Murray, Anna Phillips and Hayley Wong who were adorable in their roles as the orphans. Many thanks to Lisa McQuarrie for light design and set-up, to William Stewart for sound, and to the often forgotten but enormously important backstage crew. Congratulations to the students and staff from the Fine Arts department for another wonderful year of performance. Finally, a huge thank-you to those who donated so generously at the door – a cheque for over $900 is being sent to the Women in Need foundation.